I used open source "Open Shot" to make this slide show. It was really easy to learn how to use, and very fun to make. And free. I love it! Your slide show is so beautiful! Very moving! I love how the wonderful sunlight is shining in almost every picture! Fantastic! What a wonderful slide show! Could you please tell the name of the song too? Amazing! Your school is an inspiration. Thank you for sharing! I would like to make a memorable & beautiful thing like that for our children too! Hi Maria, the song is from the movie/show "Rent". Wow! 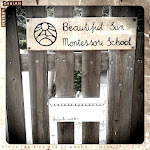 This is why I LOVE Montessori! I especially love the teachers! So inspiring, and making me miss my class even more in the holidays now!